Successfully Added Mobile Phone and USB Charging Kit - Connectors and Battery Bag to your Shopping Cart. New all in one tool bag with a multitude of useful phone and USB connectors along with a battery charger to ensure you always have power when you need it. 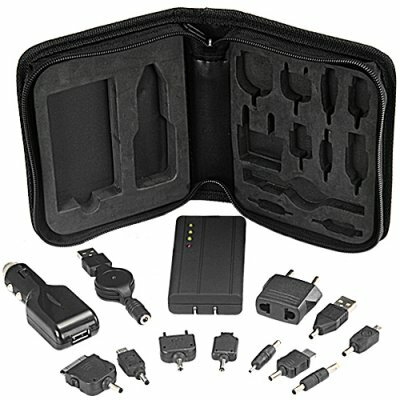 This one handy toolbag supplies everything you need for recharging your cellphones and portable USB devices. For the price you might pay at the local store to buy one single extra connector for your mobile phone, now you can have two whole kits containing the phone connectors you need along with others you can use on your other USB gadgets or share with friends! Great for travelers and people who often work outside the office, always have the power you need for your devices with one of our Mobile Phone and USB Charging Kits. The CVJF-G138 is guaranteed to make you feel like it the best $20 you ever spent! Available right now in our warehouse for bulk stock orders. Place your order today and we will ship it out tomorrow! Instant power for your phone or USB powered devices! Battery Pack/Charger has a 2500mAh capacity battery, which will fully recharge almost all popular portable electronic devices. Will this kit work with my HTC Hero? The list shown above indicates all the phones we were able to test in our office. There may be more brands / types that work with this kit. This list is up to date as of OCT '09 based on the Cellular Phones we have available to test here. There are many more phones it is compatible with, so if your connector looks like one pictured above we encourage you to buy and try for yourself. Can I get me company imprint on the outside of the zipper case? If you plan on ordering 100+ pieces, then we may be able to assist you with your request.